A photograph of Major Edward Cooper V.C., J.P. (as a sergeant) with three other soldiers of the Great War. He was in the 12 battalion Kings Royal Rifle Corps (29th Light Division) when he was awarded Stockton’s only Victoria Cross. This entry was posted in 1914-18, People by Picture Stockton Team. Bookmark the permalink. A great shame the event was not given greater publicity as I’m sure many people including myself would have liked to have been present for the dedication service. I have the autograph book of my Aunt who was a nurse in a war hospital during the W.W.1 (not sure which hospital). In it is a short verse by Sgt. E.Cooper V.C. 12th battalion dated 17th September 1917. 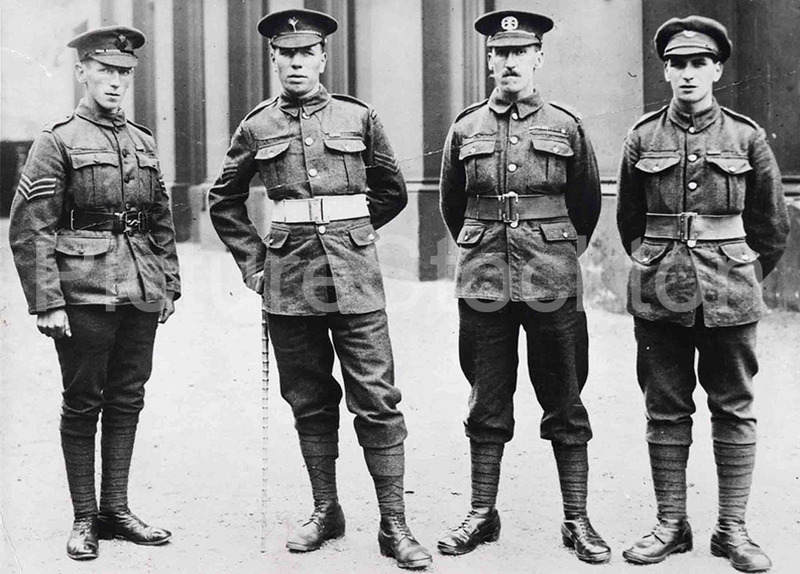 The three other soldiers are also VCs, my Godfather is on the far right, Wilfrid Edwards. Sergeant R.Bye, V.C., 1st Welsh Guards. Private W.Radcliffe, V.C., South Lancs. Regt. Private W.Edwards, V.C., 7th Yorks. Light Infantry. As there is a room in the Stockton Masonic Centre named after this VC hero, can anyone confirm whether Sgt. Cooper was a Freemason. About 10% of VC winners were Masons! Cooper’s battalion, 12th KRRC, was in the 20th (Light) Division, not 29th Light Division as stated in the paragraph above the photo. Major Cooper was my Great great uncle, his sister Jessie was my great grandma. She married and moved her family to the midlands in 1923. I got to meet him twice, once at five or six he came to her funeral, and again at 10 he came to see my gran and other family. Last Saturday I attended a wedding reception at Stockton Masonic Hall. The hall has a room named after the Major and there is a small display recognising his V.C and military service. Major Cooper’s medals are still held in Preston Hall Museum. The museum is currently undergoing a refurbishment and will reopen in 2012. A personal viewing can be arranged by contacting Stockton Museums Service. Major Cooper was my great uncle. My dad (Leslie Oates Son of Hilda and Edward) regularly told the story of how he was awarded the VC to me and my brother as we were growing up. We were always in awe of the bravery he showed and how modest he remained. I remember seeing the portrait at Preston Hall Museum but this was a very long time ago, at the time I know that the VC was in the vault at the museum. Does anybody know why the medal or the portrait are today? I would love to take my children along to learn something of their ancestry. My great grandma was Jessie Bailey (nee Cooper), his older sister. I remember him coming to see her in the midlands as a very young child and being told all about him, now my children too knew of our family hero. During the summer of 1970 I was 7 years of age and we moved into 8 Park Avenue, Thornaby-on-Tees. My parents purchased the house from Major Cooper VC. I remember Major Cooper as a gentleman who was very well respected in Thornaby and I can also recall him collecting donations for the Haig poppy appeal. It would be a fitting gesture to erect a memorial in honour of the Major adjacent to the war memorial which is around the corner from Park Avenue. These days we apply the title hero far too cheaply, especially when it’s applied to mediocre overpaid footballers. Let’s honour a true Teesside hero. In august 1977 I, Eric Powell, commisiond the bronze plaque to comemorate the award of the Victoria Cross 60 years earlier to Sgt Edward Cooper and it is displayed in the library at Stockton on Tees. Also, I have the framed photogragh and signed citation of him receiving the VC from the king on the forecourt of Buckingham Palace and I also have other items which where given to me by Edward Cooper relating to his Victoria Cross. If you wish to contact me please ask the Picture Stockton Team to pass your detials to me. In august 1977 I, Eric Powell, commisiond the bronze plaque to comemorate the award of the Victoria Cross 60 years earlier to Sgt Edward Cooper and it is displayed in the library at Stockton on Tees. Also, I have the framed photogragh and signed citation of him receiving the VC from the king on the forecourt of Buckingham Palace and I also have other items which where given to me by Edward Cooper relating to his Victoria Cross. My Grandfather (on my mothers side) was William James Mothersill of Stockton and later Thornaby-on-Tees; He served in the KRRC (Pte S-5565)with Sgt (later Major) Cooper, he never talked about his WWI experiences but my Nana Mary Jane Mothersill said he was present during the action for which Sgt Cooper was awarded the VC; In 1946 my grandparents moved into 10 Balmoral Ave, Thornaby – one of the first houses to be completed post WWII, Maj Cooper as he then was lived directly behind him in Park Ave (# ? ); Curiously, as I understand it the two “old comrades” never spoke to each other even though there was only a low wall with a gatehole (no gate) between the two houses!!! Rfn William James MOTHERSILL, S/5565, was in 10th battalion, The Rifle Brigade, and later the Hampshire Regiment. He was not in the KRRC. 10/RB were in 59 Brigade, 20th (Light) Division. Sgt Cooper’s battalion, 12/KRRC, were also in 20th (Light) Division, but a different brigade, 60 Brigade. It’s possible he was temporarily loaned to 12/KRRC – it was not uncommon for sections/platoons to be swapped between units in 20th Divn for short periods, but usually within the same brigade. Any permanent transfer to 12/KRRC would usually be shown on the medal index card, which it is not in this case. As they served in the same division, Mothersill is certainly likely to have been within a half mile or so of Sgt Cooper and would have been involved in the same action, but the do not appear to have served in the same battalion. Major Cooper and my father,Arthur, were brothers and were both true gentlemen. For Stewart C Summers. KING”S ROYAL RIFLE CORPS The battle fought in the summer of 1917 which is known in the official history books as Third Ypres, was a four month slog through mud and blood which achieved nothing except the death or wounding of 300,000 British troops and rather less than that number of Germans. But as in so many other campaigns the incompetence of the High Command was matched only by the heroism of the junior officers and men who had to carry out their orders. Over sixty VCs were won during Third Ypres. One of them was awarded to a dogged little sergeant named Edward Cooper who had already survived two years in the trenches and was now Second in Command of a platoon of thirty men of the King”s Royal Rifle Corps. As they waded through the mud on the approaches to the shattered Belgian village of Langemarck, the advancing troops came up against a line of German pillboxes, which were almost impervious to artilllery bombardment. Each block-house was equipped with two or more machine-guns and the British were caught in the interlocking fields of fire. Within minutes half the battalion were dead or wounded including Cooper”s Platoon Commander. Shocked and angry Cooper picked up the dead officer”s shiny new revolver and dashed into the attack against the nearest pillbox. Noticing that the machine guns were limited in their arc of fire he worked his way round to one side so that the fire of the bullets could not reach him, crept up close and fired the revolver down the barrel of one of the guns. Both machine guns were shot into silence. Cooper then marched around the back of the block-house and called on the enemy to surrender. Forty-five men with eight machine guns emerged and surrendered to him in full view of their comrades who were lining the trenches a few hundred metres away. When they realised what was going on the German troops in the trenches opened fire, missed Cooper and shot several of their own side. By the book, Cooper did everything wrong. He should have lobbed a bomb into the block-house, but he was a compassionate man and did not like to take life unnecessarily. When a senior officer arrived on the scene he abused Cooper for being off his line of advance, but eventually his achievement was recognised. On his own, armed only with a pistol, he had taken a position which could well have resisted an attack by a whole company. He was not sent on leave until 15 January 1918, nearly five months after the action in front of Langemarck, and when he left the front he still did not know anything about an award. It was not until he was sitting in a YMCA cafe at King”s Cross railway station that he happened to see a newspaper carrying a list of the new VCs. The name of Chavasse caught his eye – Captain Noel Chavasse who had just won a Bar to his VC, one of only three men ever to do so and the poor man died shortly afterwards. Next in alphabetical order was Cooper.E. It was not until he had read and re-read the name and the regimental number that he realised that it was his own citation that he was reading. The small shy sergeant in the corner of the carriage said nothing, but when the train finally reached Darlington, where he had to change, Cooper was astonished to find his father and his elder brother waiting for him. Then, to his enormous embarrassment, a civic reception awaited him at Stockton-on-Tees. For thirty-five years he lived in modest obscurity until the Victoria Cross Association was formed in 1953 and someone hunted him down. Suddenly he was a hero all over again. On 24 July 1985 Edward Cooper VC was given the Freedom of Stockton but he died less than four weeks later on 19 August 1985. I believe Sgt Cooper received his VC in person from the King at an Investiture at Buckingham Palace on 26 September 1917. The action at Langemarck took place on 16 August 1917 and the award of the VC was gazetted on 14 September 1917. Clearly these facts are at odds with the description above, charming though that is. Perhaps Eric Powell could confirm the investiture date? Cooper was certainly known for his modesty about Langemarck. Chris Lloyd has written an excellent article for The Northern Echo about Cooper, published on 06 Nov 2013. http://www.thenortheastatwar.co.uk/?p=302. Lloyd places Cooper as setting off on leave on 14 Sep 1917 which removes these inconsistencies in the dates. As one would expect in an article for the general reader though, he cites no references for that date. The 12/KRRC War Diary mentions 30 men from ‘A’ Company killed, wounded or missing after enemy shelling on 10 September 1917, which corroborates Lloyd’s reference to 29 men in Cooper’s platoon killed or wounded on 10 September, but the War Diary is strangely silent on both Cooper’s individual action at Langemarck and his subsequent gazetting for the VC. Full details are given on various other gallantry awards – DSO’s, MC,s, DCM’s, MM’s etc. The battalion was of course still in the thick of Passchendaele at the time though. There is an excellent article on Edward Cooper on the KRRC Association website here: http://www.krrcassociation.com/vc/cooper.htm. My grandfather was a Corporal in 12/KRRC and had the honour to serve alongside Sgt Cooper. Does anyone please have a photo or two of Major Cooper, VC, which I could use in an upcoming slideshow presentation on Passchendaele to the Western Front Association? Also, could anyone give me any details of his postwar service, particularly his service in WWII. Any assistance would be greatly appreciated as my presentation is later this month. (Eeek!) Many thanks. K.R.R.C. stands for Kings Royal Rifle Corps. Now part of the Light Infantry. Any rifleman would be appalled to see this howler! The KRRC and The Rifle Brigade were never part of The Light Infantry 1968-2007 but maintained the rifles traditions in the Royal Green Jackets. That tradition continues unbroken today after the formation of the The Rifles in 2007, which also saw the incorporation of The Light Infantry into the new regiment. The KRRC’s direct descendant is 2/Rifles, but the intention is to blur the distinctions between the battalions and have all seven battalions in The Rifles share the traditions of their antecedent regiments in common. The Green Howards have no connection with the KRRC nor the Royal Green Jackets. I have an entry in an autograph book which belonged to my Aunt, a nurse, signed by a Sgt.E.Cooper, V.C. 12th Battalion, and initials which look like K.R.? C. on what looks like Sept. 17th. 1917. I am Major Cooper”s great grandson, Thomas (above) is a cousin of mine. Last week a police horse was named in Major Cooper”s honour. I lived next door to Harry Cooper in Redmarshall, I remember talking to Major Edward on many occasions when he and Mrs Cooper visited Harry and his family. He told me about the winning of the VC and the French equivalent for rescuing French wounded under heavy German fire when he was coming from the British lines on his way home to England. Also Harry told of the time when he Major Edward stopped a runaway horse in Church Road by standing in front of it, Bringing it to a halt a very brave unassuming man, A real Gentleman it was my honor to Know. I read on some web site ( can”t remember which one) that the medal is in the museum in the Green Dragon yard. I am suprised as one would have though that the Green Howards would have managed to get it for their Museum in Richmond. This is my great grandad. In 1970 I worked with Major Cooper”s Daughter-in-Law, Margaret. One day she asked me if I would type up a report on what her father-in-Law had done in the 1st World War in order to win his Victoria Cross. I still have a copy of this somewhere. Even though I was very young at the time I was so impressed by this mans bravery. He had single handedly taken over a pill box that was inhabited by german troups. They were shooting at his men so he charged them. His bravery in doing this saved his men. I agree, there should be a statue to Major Cooper. With regards to a statue, I was visiting Preston Hall Museum Stockton, in March 1980 with my young son and my father Wilfred ( Wilf) Webster. As we entered the main doorway hanging on the wall was a lifesize portrait, immediately he saw it my father said thats my uncle, VC Cooper. At the time I thought no more about it and my dad didn”t go into details. In 2001 my sister in law introduced me to geneology and we were trying to trace my fathers side of the family. I told her about VC Cooper and we tried to trace him through Preston Hall Museum, by asking about the portrait. My sister in law was on a visit from Australia at the time and so made a visit to the museum. Unfortunately they couldn”t remember the portrait, it certainly wasn”t hanging there any more. and all they could say was it must be in storage somewhere. So I suppose I would agree with Geoff a statue would be appropriate, at least it would be on view and not in storage. Regards Joyce Wright nee Webster. If you want to know why Major Cooper was awarded his VC please read the story of his bravery at http://www.homeusers.prestel.co.uk/stewart/aaholder.htm#Cooper He captured 45 German soldiers with their machine guns when he was armed with just his pistol. What a man! His Wikipedia entry suggests that his VC is at Preston Hall Museum, is this correct ? I think that a statue should be dedicated to him and it should be placed outside the town church near to the war memorial. Hence to show the links between him, the war, and the brave dead of the two world wars. regards Geoff. Major Cooper was a regular attender at Thornaby Congregational Church Mansfield Avenue Thornaby. He was also a J.P for many years. He sat at Thornaby Magistrates Court George Street Thornaby. Major Cooper was my first boss when I used to work for Stockton co-op fruit, he was such a fair man, I used to work Saturday mornings on the fruit and veg van, I was only fourteen at the time and worked with a man called Peter Deighton. Peter who is still alive today must be in his seventies and does not look a day older.